Could you lend a hand? We made it!!! Spring is here and with it comes the need to once again get out of the house. We have big plans for you and we're kicking off the season with all new classes below. We've stocked our shelves with new ready-to-paint pieces sure to fit right in with your decorating ideas for Spring. We are also up-to-date on the new "fashion colors" for 2019......Notice that "Fuchsia" is everywhere you look.... We have it here for your use on a fun new piece. We also stock brushes, paints, glazes, clay, Precious Metal Clay (PMC), and much more, for your convenience in completing your projects. A reminder we do Birthday Parties and "Parties For Any Reason"......call or come in for details. Dates fill up fast so don't wait to sign up for your Special Occasion. Check out our web page for more info on ongoing activities such as our "One Shot Pot" Pottery classes.....to just give pottery on the wheel a try to see if you like it and want to invest in more classes. Come in and See Us....You'll Be Glad You Did!!!!  We are going to use your design skills and imagination to create a one-of-a-kind platter using stoneware clay, or just use our sample designs shown above. When complete, your platter will be oven, microwave and dishwasher safe.....something you'll love using at your next party. So come join us for a night of fun...make new friends....bring your own drinks and snacks. You must be 18 to attend due to alcoholic beverages present. The Easter Bunny comes in all flavors....Strawberry, Blueberry, Chocolate and more.....What's your favorite? Come make yours and paint him in any color (flavor) you choose. 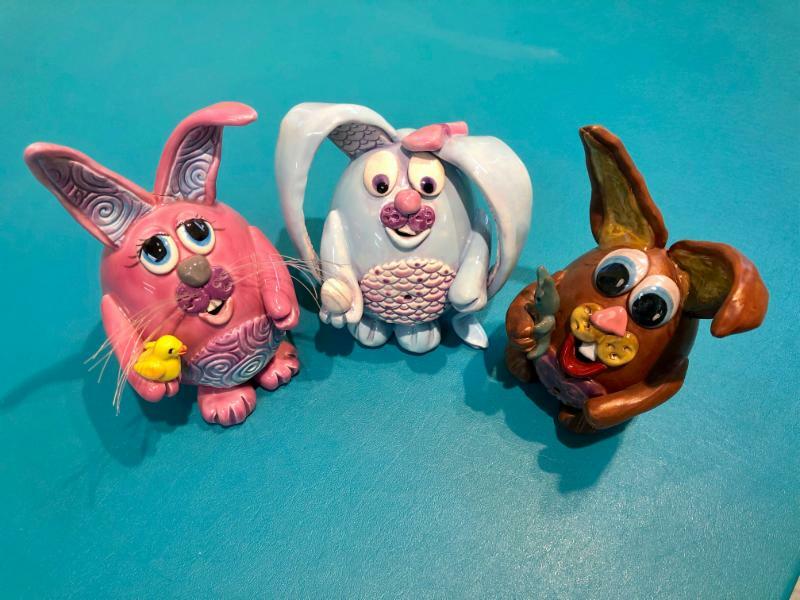 We'll use wet clay to design your Bunny and add eggs, chickens, or carrots for fun. So start thinking before class what your favorite flavor is going to be and be ready to have lots of fun making your own Bunny. Need some time with just Dad? We've designed a night just for the two of you. 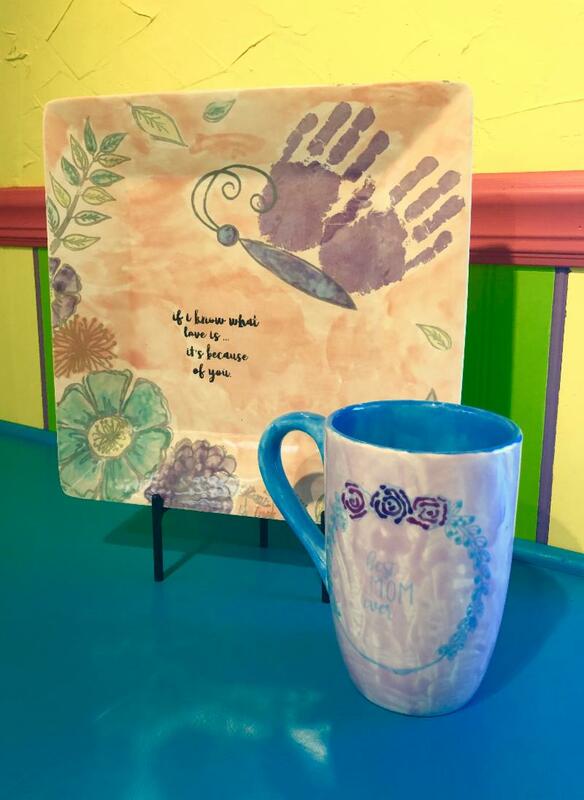 Pick any ready-to-paint bisque plate, platter or mug and we'll show you how to make your special designs using silkscreens, stencils, and paint. Come meet other kid's who just want to have fun with Dad!!!! 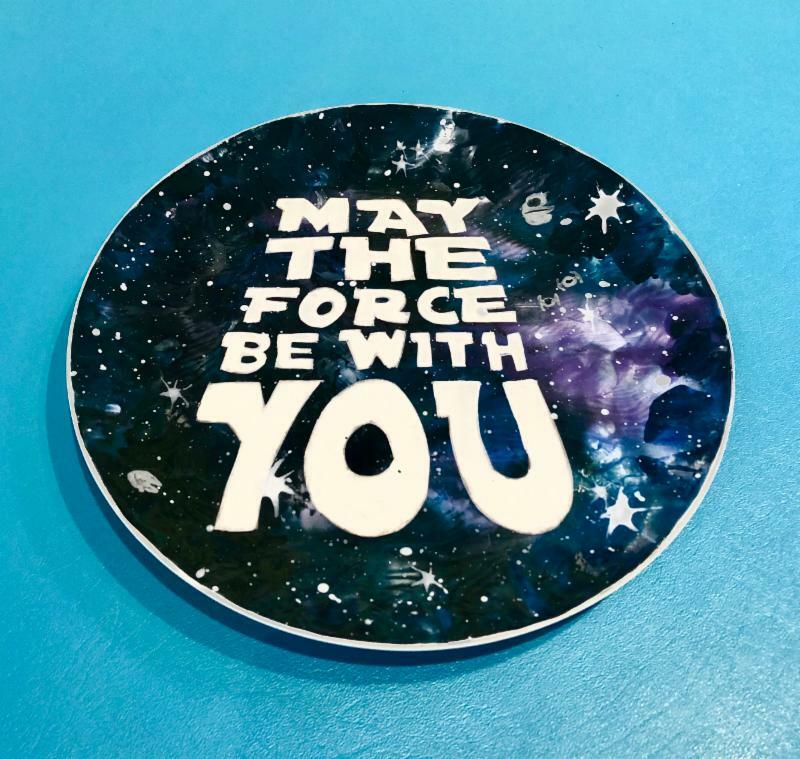 For all the Star Wars fans among you....here's your chance to create your own memory by designing and painting your Star Wars Plate. Choose any plate or platter and we'll show you how easy it is. Bring a friend and see which design can be the best piece in your Star Wars collection.